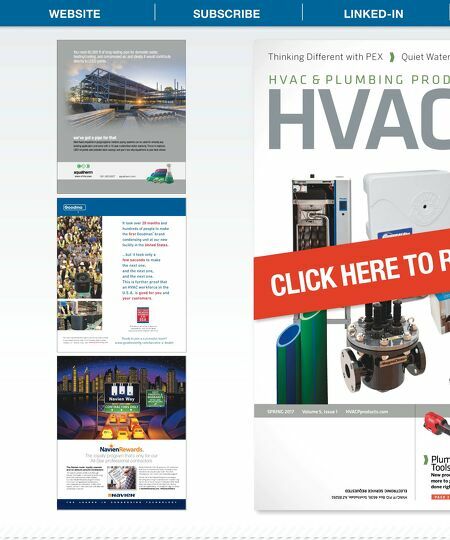 HVAC/P - HVAC and Plumbing Product News magazine - is the go-to resource for the latest products in the industry. 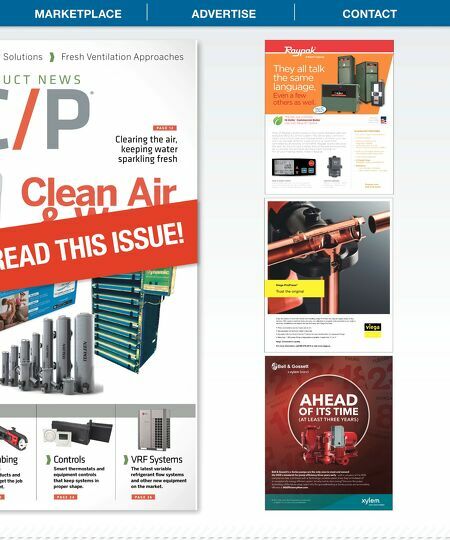 er Solutions Fresh Ventilation Approaches D U C T N E W S P A G E 2 6 VRF Systems The latest variable refrigerant fl ow systems and other new equipment on the market. Plumbing ools products and get the job right. P A G E 2 4 Controls Smart thermostats and equipment controls that keep systems in proper shape. 3 P A G E 1 2 Clearing the air, keeping water sparkling fresh Clean Air & Water Hi Delta KEY FEATURES • On-off or stage fired available • Indoor/outdoor • Versa IC Control and diagnostic center -Cascade up to 4 units -Built-in equal run time rotation • Built-in cold wate r prote ction control just add 3-way va lve • Low Lead Compliant • 13 Model Sizes 399MBTUH thru 2340MBTUH • Efficiency • 84% Boilers- standard • 85% Water Heaters- standard Most of Raypak's boiler products now come standard with our exclusive Versa IC control system. This allows easy communi- cation and control over your Raypak boilers. Whether your de- sire is to cascade different types of units or have them controlled by an existing on-site BMS, Raypak boilers are up to the task. It's time to take a closer look at Raypak products and let us prov ide the solutions yo u have been looking fo r. For all your heating needs, make it Raypak. The new and improved Hi Delta ® Commercial Boiler now with Versa IC ® control Optional Gateways BACNet ® IP, BACNet ® MS/TP N2 Metasys ® , Modbus ® TCP or Lonworks ® Raypak.com 805.278.5300 They all talk the same language , Even a few others as well. N ew f or 2017 H i D el t a now wi t h Versa I C ! Versa IC Boiler Control Raypak's boiler products can communicate with each other effortlessly and with most BMS as well. Modbus ® RTU port (RS485) standard on all models. Proudly Asse mbled in the U.S.A. Enjoy the peace of mind that comes with installing Viega ProPress, the original copper press joining solution. With system-matched tools and jaws, no calibration is required and connections are made in seconds. Installations and repairs are fast and easy with Viega ProPress. • Press connections can be made wet or dry • Secure press connections made in seconds • Equipped with the Smart Connect ® feature for easy identification of unpressed fittings • More than 1,000 press fitting configurations available in sizes from ½" to 4" Viega. Connected in quality. For more information, call 800-976-9819 or visit www.viega.us Viega ProPress ® Trust the original © 2017 Xylem Inc. Bell & Gossett is a trademark of Xylem Inc. or one of its subsidiaries. Bell & Gossett's e-Series pumps are the only ones to meet and exceed WKH'2(ōVVWDQGDUGVIRUSXPSHIƓFLHQF\WKUHH\HDUVHDUO\– well in advance of the 2020 compliance date. Combined with a Technologic variable speed drive, they're the heart of DQH[FHSWLRQDOO\HQHUJ\HIƓFLHQWV\VWHP6RZK\ZDLWWRVWDUWVDYLQJ"'LVFRYHUWKHSXPS WHFKQRORJ\RIWKHIXWXUHWRGD\/HDUQZK\WKHJURXQGEUHDNLQJH6HULHVSXPSVDUHVRLQFUHGLEO\ HIƓFLHQWDW%*(IƓFLHQF\1RZFRP. AHEAD OF ITS TIME (AT LEAST THREE YEARS) MARKETPLACE ADVERTISE CONTACT READ THIS ISSUE!